Adding some metallic colours into your Winter wardrobe is the perfect way to glam it up. This style is a huge trend this season and gives any look that extra little sparkle. Try not to go over the top with it. If you’re wearing a metallic top or dress then leave it at that. Please don’t do the matching shoes and bag thing, it’s never a good look. Metallics glitter and make such a dramatic statement. Just like this dress below. If you notice, the dress is doing all of the talking. Her shoes, hair and make-up is minimal. Always let the metallic piece stand out. One thing about this beautiful dress is how the bronze colour is reflecting perfectly off the black undertones. Paired with the black tights and shoes, the dress catches every stylish ladies heart. 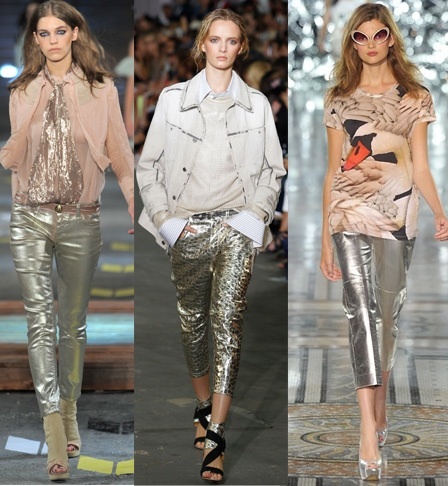 These next three outfits have to be the most fabulous and gorgeous metallic looks I have seen. As you can see, they are paired with neutral colours so that the outfit isn’t too vibrant or in your face. I think we should all start off the new year with some daring metallic looks. I’m on the hunt now for my perfect look. Have fun!